Hydraulic Tail Lift offered by us is most comprehensive Tail Lifts that are precision designed to solve different transport issues to perform in harshest operating conditions. Aluminium Tail Lifts are built of high tensile aluminium alloy, All the parts, including the hydraulic cylinders, are completely corrosion protection.Aluminium does not need any special treatment to keep it looking nice. Aluminium tail lifts are available for load capacities of 750, 1000, 1500 and 2000 kg. PALFINGER Tail lifts offer a choice of steel or aluminium platforms and is frequently chosen for use by the food and drink distribution industry. The 4-cylinder lift mechanism is available with 5 different lift arms, ranging from 600 mm to 1100 mm. The tail lifts are designed for vehicles with small overhangs and drawbar trailers. Tail lifts make it much easier to safely load and unload trucks and are synonymous with cost efficiency, flexibility and a high level of operating comfort for users. Nandan Ground Support Equipment Pvt. 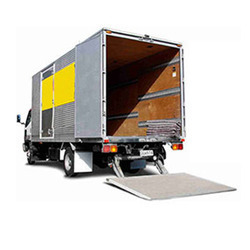 Ltd.
With our in-depth knowledge of this domain, we are actively engaged in offering an excellent quality assortment of Vehicle Tail Lift. We are engaged in offering our prestigious clients a very high quality range of Column Tail Lift to handle capacity load of 2.5 ons maximum. Our range is known for its higher quality and better performance. Manufactured from quality raw material, these are tested on well-defined parameters before being delivered to our clients. 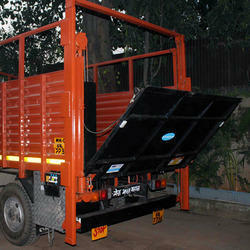 We are immersed in offering Hydraulic Tail Lift. Light in weight, these lifts are damage free and superior in finishing. Wider based embedded this lift is available for patrons in various sizes and more technical specifications. We charge minimal price for this hydraulic unit of premium quality.